Undoubtedly, professional football hails as the most popular sport around the world. Dozens of football players, coaches, managers, agents, and fans are partake in it every day in some form, whether it is earning money, entertaining, or simply watching this sport. However, a crucial issue that requires attention is the immigration of players to foreign championships in order to be able to take advantage of professional opportunities or to find a way into more advanced football leagues. The purpose of this book is to study the immigration of athletes onto the European football field, with an emphasis on the Greece Superleague. The main conclusion that has emerged from this study is that more and more Greek players take advantage of the free market and choose to leave by migrating to find better working conditions in one of the most advanced European championships. 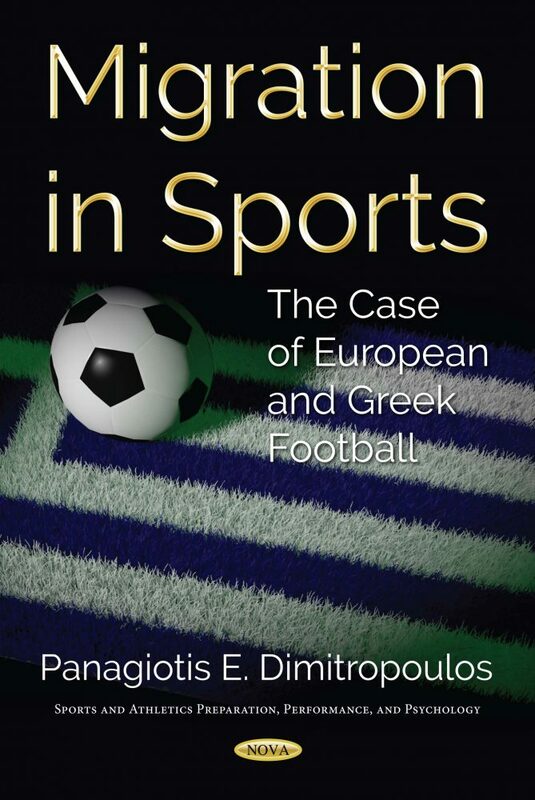 At the same time, this book addresses that the flow of foreign athletes has increased remarkably in all European countries and in Greece specifically, which is the seventh highest host European country of migrant footballers, despite the small size and competitiveness of the Greek league. Bale, J., and Maguire, J. 1994. The Global Sports Arena: Athletic Talent Migration in an Interdependent World. London: Frank Cass. Conn D. 1997. The Football Business: Fair Game in the ‘90s? London: Mainstream Publishing. Darby, P. 2000. “The new scramble for Africa: African football labour migration to Europe.” The European Sports History Review 3: 217–244. Dimitropoulos, P. E., Leventis, S. and Dedoulis, E. 2016. “Managing the European football industry: UEFA’s regulatory intervention and accounting quality.” European Sport Management Quarterly 16: 459–486. Kesenne, S. 2014. The Economic Theory of Professional Team Sports: An Analytical Treatment. London: Edward Elgar. Lanfranchi, P., and Taylor, M. 2001. Moving with the Ball: The Migration of Professional Footballers. Oxford: Bloomsbury Academic. Magee, J. and Sugden, J. 2002. “The world at their feet: Professional football and international labor migration.” Journal of Sport and Social Issues 26: 421–437. Muller, J. C., Lammert, J. and Hovemann, G. 2012. “The Financial Fair Play Regulations of UEFA: An adequate concept to ensure the long-term viability and sustainability of European club football?” International Journal of Sport Finance 7:117–140. O’Brien, M. 2001. “Labour.” In Anti- Capitalism: A Guide to the Movement, edited by E. Bircham and J. Charlton, 69–78. London: Bookmarks Publications Ltd.
Papaloukas, M. 2012. The European Sport Market. Athens, Papaloukas M. (in Greek). Peeters, T. and Szymanski, S. 2014. “Financial fair play in European football.” Economic Policy 29: 343–390. Poli, R., Ravenel, L. and Besson, R. 2015. “Exporting countries in world football,” CIES Football Observatory Monthly Report No. 8, Neuchâtel, October. Szymanski, S. 2001. “Income inequality, competitive balance and the attractiveness of team sports: Some evidence and a natural experiment from English soccer.” The Economic Journal 111: 69–84. Thome, M. 2003. “Ausländer in der Fussball-Bundesliga,” ["Foreigners in the Bundesliga,"] Mainz, Volkskunde in Rheinland-Pfalz Nr. 18/2: 154–178. UEFA 2010. UEFA Club Licensing and Financial Fair Play Regulations. Zurich: UEFA. Vöpel, H. 2009. “Wettbewerb und Regulierung in der Fußball Bundesliga.” [“Competition and regulation in the football league.”] Wirtschaftswissenschaftliches Studium 38: 629–34. Vroomann, J. 2000. “The economics of American sports leagues.” Scottish Journal of Political Economy 47: 364–398. Agergaard, S. 2008. “Elite athletes as migrants in Danish women’s handball.” International Review for the Sociology of Sport 43: 5–19. Agergaard, S. and Ryba, T. 2014. “Migration and career transitions in professional sports: Transnational athletic careers in a psychological and sociological perspective.” Sociology of Sport Journal 31: 228–247. Antonioni, P. and Cubbin, J, 2000. “The Bosman ruling and the emergence of a single market in soccer talent.” European Journal of Law and Economics 9: 157–173. Bale, P. 1991. “Antropometric body composition and performance variables of young elite female basketball players. The Journal of Sports Medicine and Physical Fitness 31: 173–177. Caiger, A. and Gardiner, S. 2000. Professional Sport in the European Union: Regulation and Re-regulation. London, TMC Asser Press. Chatzaroula, P. 2007. “Perceptions of gender and domestic labour in Albanian migrants’ testimonies in Greece.” PhD. Thesis, University of Aegean, Greece. Dabscheck, B. 1996. “Playing the team game: Unions in Australian professional team sports.” Journal of Industrial Relations 38: 600–628. Dimitrakopoulos, D. 2006. “More than a market? The regulation of sport in the European Union.” Government and Opposition 41: 561–580. Dobson S. and Goddard, J. 1998. “Performance and revenue in professional league football: Evidence from Granger causality test.” Applied Economics 30: 1641–1651. Duke, V. 2002. “Local tradition versus globalization: Resistance to the Donaldisation and Disneyisation of professional football in England.” Football Studies 5: 5–23. Engh, M. H. 2014. “Producing and maintaining mobility: A migrant-centred analysis of transnational women’s sports labour migration.” Ph.D thesis, Aarhus University, Netherlands. Giddens, A. 1998. The Third Way. Cambridge: Polity Publications. Giulinotti, R. and Robertson, R. 2007. “Forms of glocalisation: Globalization and the migration strategies of Scottish football fans in North America.” Sociology 41: 133–152. Heinemmann, K. 1993. Sport in Developing Countries. Champaign Illinois: Human Kinetics. Magee, J. D. and Sugden, J. P. 1998. “Simply the best: Patterns and early career experiences of migrant Northern Ireland soccer players.” Scottish Centre for Research Papers in Sport, Leisure and Society 3: 57–69. Maguire, J. 2011. “Globalization, sport and national identities.” Sport in Society 14: 978–993. Maguire, J. and Pearton, R. 2000. “The impact of elite labour migration on the identification, selection and development of European soccer players.” Journal of Sport Sciences 18: 759–769. Massey, D. Arango, J. Hugo, G. Konaouci A. Pellegrino, A. and Taylor, J.E. 1993. “Theories of international migration: A review and appraisal.” Population and Development Review 19: 431–466. McArdle, D. 2000. “They’re playing R. song: Football and European Union after Bosman.” Football Studies 3: 42–66. Morris, P. Morrow, S. and Sprink, P. 1996. “EC law and professional football: Bosman and its implications.” Modern Law Review 59: 893–899. Musgrave, R. 1990. “Horizontal equity, once more.” National Tax Journal 43: 113–122. Stokvis, R. 1989. “The international and national expansion of sports.” In Sport in Asia and Africa: A Comparative Handbook, edited by E.A. Wagner, 13–24. New York: Greenwood. Weatherill, S. 1989. “Circumventing the pitfalls of article 177EEC.” Modern Law Review 52: 232–236. Williams, G. 1982. “Offences and defences.” Legal Studies 2: 233–256. ASSH 2010. “Ethnicity and soccer in Australia.” Accessed July 24, Australian Society for Sports History Incorporated. Available at: http://library.la84.org/SportsLibrary/ASSHSSH/ASSHSSH10.pdf. Basker, E. 2003. “Education, job search and migration.” Accessed July 24, Working paper, University of Missouri, Columbia. Available at: http://legacy.iza.org/en/webcontent/events/trans atlantic/papers_2003/basker.pdf. Dolles H. and Soderman S. 2005. “Globalization of sports: The case of professional football and its international management challenges.” Working paper, German Institute of Japanese Studies. Flecha, R. and Puigvert, L. 2002. “Multiculturalismo y educación.” Multiculturalismo y educación física [“Multiculturalism and education.” Multiculturalism and physical education] 1: 9–45. FRA. (2010). “Racism, ethnic discrimination and exclusion of migrants and minorities in sport.” FRA Research. Austria. Hahn, K. L. 2010. Are Athletes Good Role Models? Detroit: Greenhaven Press. Kennet, C. 2005. “Sport, immigration and multiculturality,” Ph.D. thesis, Univeristy of Barcelona. Kleven, H. Landais, C. and Saez, E. 2012. Taxation and international migration of superstars: Evidence from the European football market. New York: National Bureau of Economic Research. Portes, A. and Zhou, M. 1993. “The new second generation: Segmented assimilation and its variants.” Annals of the American Academy of Political and Social Science 530: 74–96. Poli, R., Ravenel, L. and Besson, R. 2015. “Exporting countries in world football.” Accessed August 10, CIES Football Observatory Monthly Report. Available at: http://www.football-observatory. Reid, C. Stewart, E. and Thorne, G. 2004. “Multidisciplinary sport science teams in elite sport: Comprehensive servicing or conflict and confusion?” Sport Psychology 18: 204–217. Stodolska, M. and Alexandris, K. 2004. “The role of recreational sport in the adaptation of first generation immigrants in the United States.” Journal of Leisure Research 36: 379–413. Thibault, L. (2009). “Globalization of sport: An inconvenient truth.” Journal of Sport Management 23: 1–20. Bourke, A. 2003. “The road to fame and fortune: Insights on the career paths of young Irish professional footballers in England.” Journal of Youth Studies 5: 375–389. Dolles, H. and Soderman, S. 2005. “Globalization of sports: The case of professional football and its international management challenges.” Accessed 15 August, German Institute of Japanese Studies. Available at: https://www.researchgate.net/publication /242768634_Globalization_of_Sports_The_Case_of_Professional_Football_and_its_International_Management_Challenges. Giulianotti, R. and Robertson R. 2004. “The globalization of football: A study in the globalization of the “serious life.” The British Journal of Sociology 55: 545–568. FRA 2010. “Racism, ethnic discrimination and exclusion of migrants and minorities in sport.” FRA Research. Austria. Kennet, C. 2005. “Sport, immigration and multiculturality,” Ph.D thesis, University of Barcelona. Stelnbrink, M. 2010. “The role of amateur football in circular migration systems in South Africa.” Africa Spectrum 45: 35–60. Weedon, G. 2011. “Global boys: Exploring experiences of acculturation amongst migrant youth footballers in Premier League academies.” International Review for the Sociology of Sport 47: 200–216. Anagnostopoulos, C. and Senaux, B. 2011. “Transforming top-tier football in Greece: The case of the Super League.” Soccer and Society 12: 722–736. Bryson, A., Rossi, G. and Simmons, R. 2014. “The migrant wage premium in professional football: A superstar effect?” Kyklos 67: 12–28. Di Maria, C. and Stryszowski, P. 2009. “Migration, human capital accumulation and economic development.” Journal of Development Economics 90: 306–313. Dimitropoulos, P. E. 2010. “The financial performance of the Greek football clubs.” Choregia 6: 5–27. Eschker, E., Perez, S. and Siegler, M. 2004. “The NBA and the influx of international basketball players.” Applied Economics 3: 1009–1020. Frick, B. 2007. “The football players’ labor market: Empirical evidence from the major European leagues.” Scottish Journal of Political Economy 54: 422–446. Frick, B. 2011. “Performance, salaries and contract length: Empirical evidence from German Soccer.” International Journal of Sport Finance 6: 87–118. Hill, J. R. and Groothuis, P. A. 2017. “Is there a wage premium or wage discrimination for foreign-born players in the NBA?” International Journal of Sport Finance 12: 204–221. Hoffer, A. J. and Freidel, R. 2014. “Does salary discrimination persist for foreign athletes in the NBA?” Applied Economics Letters 21: 1–5. Kiefer, S. 2014. “The impact of the Euro 2012 on popularity and market value of football players.” International Journal of Sport Finance 9: 95–110. Poli, R., Ravenel, L. and Besson, R. 2016. Foreign players in football teams. CIES Football Observatory Monthly Report, No. 12, February 2016. Travlos, A., Dimitropoulos, P. and Panagiotopoulos, S. 2017. “Foreign player migration and athletic success in Greek football.” Sport, Business and Management: An International Journal 7: 258–275. Wicker, P., Prinz, J., Weimar, D., Deutscher, C. and Upmann, T. 2013. “No pain no gain? Effort and productivity in professional soccer.” International Journal of Sport Finance 8: 124–139. Yang, C. and Lin, H. 2012. “Is there salary discrimination by nationality in the NBA? Foreign talent or foreign market.” Journal of Sports Economics 13: 53–75. The audience of this proposed publication could be social scientists, such as economists, sociologists and other who are interested on the migration phenomenon, sport managers, club owners, regulatory authorities officials and students on the field of economics, human resources, sport management and policy, political sciences at undergraduate and postgraduate level.